Low cost 3000w pure sine wave power inverter for charging home appliances. Tips: What's the role of a power inverter? In brief, a power inverter is a kind of electronic device for converting low voltage (12v, 24v, 48v) DC source into AC power source (110v, 120v, 220v, 230v, 240v etc.). Generally we invert sine wave AC power supply into DC power supply to charge our home appliances (cell phones, laptops etc. 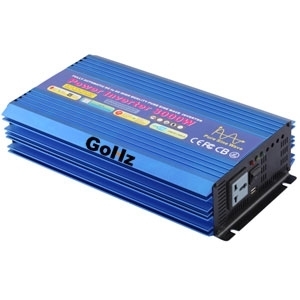 ), the role of the power inverter is on the contrary, hence the name. We are in a "mobile" era, mobile office, mobile communication, mobile leisure and entertainment. In the moving state, we not only need low voltage DC power source from a battery, but also the indispensable sine wave AC power source in our daily works, hence we need the power inverters to do the job, i.e. convert 12v DC to 120v AC, you can use a 3000w pure sine wave inverter to charge most of the house electronic devices. Must emphasize, some home appliances, such as air conditioner, refrigerator etc. the starting current is equivalent to 3-7 times of the normal operating current. Therefore, we need to make sure the starting power of such home appliances is lower than the power inverter's peak power to make the inverter & home appliances work properly.